Hi folks, Doc here, with a subject of interest to many of you out there, if your emails are any indication: airship models. I have counted myself in that group since I first saw the Amazing No. 8 Zeppelin Erector Set from the late 1920s. I would eventually own this landmark construction set, and the model it built was everything I expected it to be - you can my special feature on the set and its titular model here. On this page, we'll look at airship model designs that have appeared over the years in multiple systems, including - in addition to Gilbert Erector - American Model Builder, Meccano, Mignon, and Stabil. But, before we do so let's take a brief look at the real machines that inspired those models. An airship is a lighter-then-air machine that can be propelled and steered. There are two main types of airships: rigid and non-rigid. Rigid airships, known variously as airships or dirigibles (the latter is from the French word for "steerable"), have an internal framework - typically made of metal - that supports both the outer envelope and the engines, gondolas, tail fins, etc. The term zeppelin is also commonly applied to airships, although it originated as a specific brand name used to describe airships designed by Count von Zeppelin in Germany during the first half of the twentieth century. Non-rigid airships, always referred to as blimps, have no such internal structure. All airships are untethered, powered "aerostats", the term commonly applied to any buoyant aircraft. 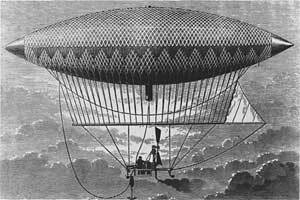 Henri Giffard's steam powered dirigible, in which he made the world's first powered and controlled airship flight in 1852. For centuries, inventive persons in many countries had sent balloons of all sizes and shapes into the air by filling them wih hot air. As the balloons grew in size over time, increasingly heavier objects were raised with them until, in the latter half of the 18th century, humans took the leap themselves and the first manned ballon flight took place in France when Jean-François Pilàtre de Rozier and François Laurent d'Arlandes took to the air in a balloon created by the Montgolfier brothers. Manned balloon flights continued into the next century. Then, in 1852 the first airship took flight when Henri Giffard flew 27 kilometers in a steam-powered balloon. Over the next several decades, airships powered by electric motors and, later, gasoline engines took to the air. Russian dirigible "Lebed", built in France in 1908. Near the end of the century, the next step in airship evolution occurred in Germany with the flight of the first rigid airship. Designed and built by aviation inventor David Schwarz, the airship also featured a solid metal outer skin. The next several years saw numerous aviation pioneers building and flying airships of various shapes, sizes, and designs. 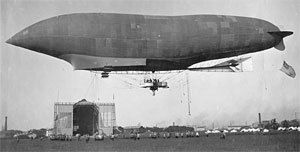 The most notable of these was undoubtedly the Luftschiff Zeppelin LZ 1, the first of Count von Zeppelin's famous airships. The LZ 1 led to more advanced and successful designs, cluminating in the great trans-atlantic passenger liners of the 1930s like the LZ 127 Graf Zeppelin (see photo below) and the tragically famous LZ 129 Hindenburg. 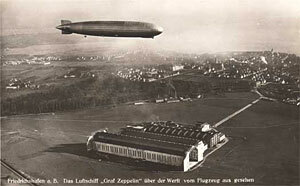 The famous LZ 127 Graf Zeppelin floating above the hangers at its home base at Friedrichshafen, Germany in 1928. The special capabilities of airships that made them such successful passenger transports also made them uniquely suitable for military use. During the First World War, England, France, Germany, and Italy all deployed airships as observation scouts and bombing platforms. In the years following the war, airship development was also underway in the United States. In 1923, the first American rigid airship, the USS Shenandoah, was launched at the the Naval Air Station in Lakehurst, New Jersey (the site of the Hindenberg disaster 14 years later). The Shenadoah, the first of four rigid U.S. airships to be built, was notable for being the first airship in history to use the inert gas helium as its bouyancy source rather than explosive hydrogen gas. By 1935, all four of these airships had been destroyed in accidents. Meanwhile, Germany continued its transatlantic passenger flights in its fleet of hydrogen filled Zeppelin airships. Then, in 1937 the LZ 129 Hindenberg exploded and crashed when it attempted to moor at Lakehurst. Without access to helium gas - the U.S. controlled world production and had refused to sell any of its supply - this public relations disaster caused Germany to ground its remaining fleet of Zeppelins. This effectively ended airship use for passenger transport. Germany ceased airship development, and during the Second World War only the United States made any significant use of airships, all of which were non-rigid. Today, airship development continues in several countries, although current use is typically confined to advertising, sightseeing, surveillance, and research. 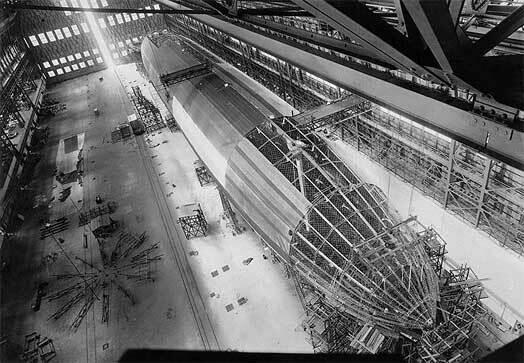 The USS Shenandoah under construction; note the complex rigid airframe beneath the skin. Before writing this feature, I scoured my collection of instruction manuals from various systems and scanned the designs I found. I also contacted some especially knowledgeable friends, Hylton and Orion, and asked them to do the same. They came up with a few additional designs that had been printed in Meccano Magazine (my thanks to them both). The results are shown below. As you can see, they range from the very small and simple to the very large and complex. Not surprisingly, all of the models but one date from before the Second World War since, as we have learned, the world had largely lost interest in airships by that time. In almost every case, the illustrations shown below were the only representation of each model. There were a couple of exceptions, including the No. 8 Erector Zeppelin, which you can see here. If you builders out there would like to take a crack at any of these designs, you can download larger, high resolution scans of the original manual pages on my Downloads page. And, if you know of any designs not depicted here, write in and let me know. Figure 1. Type I Erector No. 279 Dirigible Balloon - this large, nearly 7 foot long model could be built with the No. 8 Set. It appeared in certain Erector manuals between 1916 and 1920, and clearly reflects the actual airship designs of the period (see photos above). Figure 2. American Model Builder No. 238 Dirigible - this model could be built with the No. 3 Set. Figure 3. American Model Builder No. 314 Zeppelin - this model could be built with the No. 4 Set. Figure 4. American Model Builder No. 365 Zeppelin - this large (5 foot long) model could be built with the No. 7 Set. Figure 5. Giant Airship, as shown on the cover of Meccano Magazine No. 14, September-October 1920. It is unclear whether this model ever appeared in any Meccano instruction manual. Figure 6. This model airship appeared on page 733 of the September, 1929 issue of Meccano Magazine. Built by Robert and Otto Tondury of Zurich, Switzerland, it was awarded second prize in that year's Meccano model building contest. Figure 7. The famous Trailblazing No. 8 Erector Zeppelin model from 1929. Gilbert took his model to the next level, creating custom parts (propellors, gondolas, tail fins) as well as a cloth envelope that could be laced over the internal framework. For more details on this model, see my special feature. Figure 8. This model airship and mooring mast appeared on page 408 of the May, 1931 issue of Meccano Magazine. It is based on the British rigid airship R101, which first flew in 1929. The model, built by C. Robert and K. Tanner of Johannesburg, South Africa, was awarded first prize in the Overseas Section of that year's Meccano "Aircraft" Contest. Figure 9. Mignon No. 7 Luftschiff ("airship") - this model could be built with the top-of-the-line No. 3 Set. Figure 10. Stabil No. 187 Luchtschip ("airship") - this model could be built with the No. 3 Set. Figure 11. Stabil No. 704 Zeppelin - this large (8 foot long) model could be built with the No. 55 Set. Figure 12. Stabil No. 704 Halle mit Ankermast ("hanger with anchor mast") - this model could be built with the No. 55 Set.